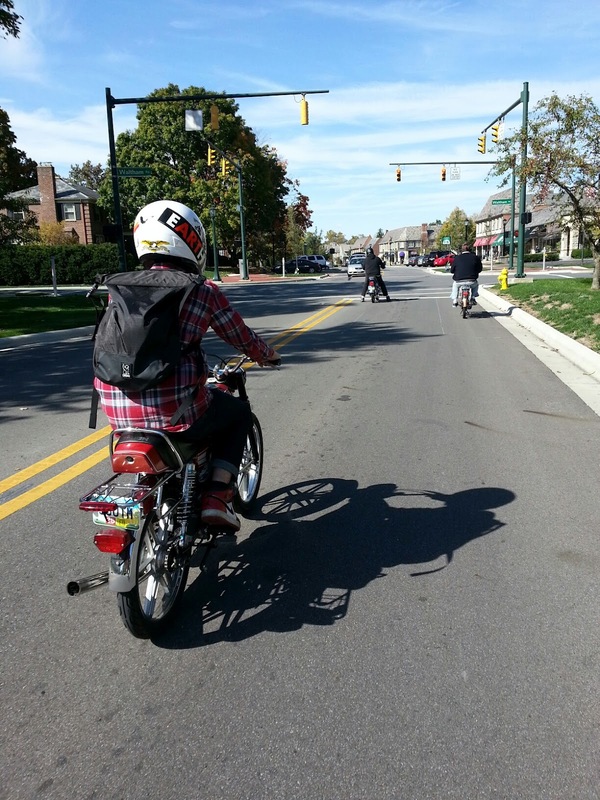 The name isn't official, but we have adopted the hashtag #cbusmopeds for our Columbus moped shenanigans. 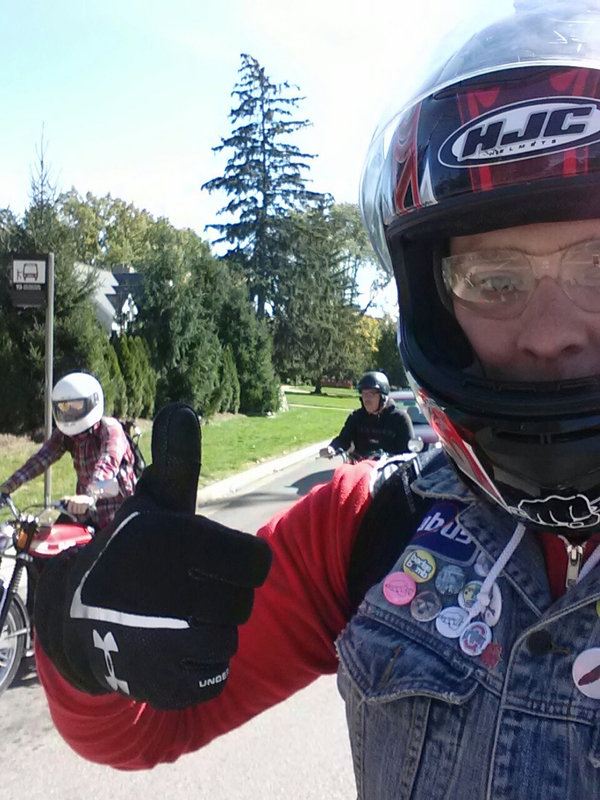 I was a little disappointed in today's ride, but it is the first one I put together and I have rode with only two other people for my first ride in Dayton. At least this time there were four of us. A lot of the Dayton guys said they wanted to come, but no one did... sad face. I grilled out and for those that showed up... smiles from ear to ear. I was stoked, as always, that Taylor showed up. The other two guys just turned 50 and they were riding stock bikes. Normally that means a fairly slow ride, but these guys had some fast stock bikes. It also worked out well for Taylor and me. Taylor was running his freshly rebuilt Gila and I was just happy to be back riding in a group... so many smiles. We rode around Upper Arlington and Grandview with some great sights. 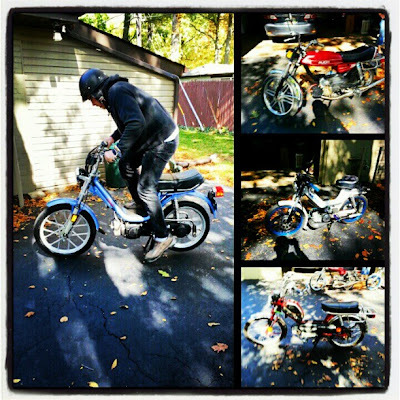 We got to talking about a lot of rare bikes and all of the connections that we have and we even gave BJ and phone call... the moped genius that used to manage all the moped glory at Handy Bikes. I kept my bike pretty tame until the very end and then I opened it up and the stockers just laughed and smiled as I went blasting back to our meet-up spot. All-in-all a pretty rad day with a rad group of guys. Hope to see them again soon so we can ride some more. Temps cooling off considerably for the remainder of the weekend. Increasing clouds tonight with temps falling into the upper 30`s. Partly cloudy on Sunday with a slim chance for a spotty rain shower and cool with highs in the lower 50`s. Clouds will clear out later Sunday into Monday morning and this will set us up for the coolest morning since early April with lows dipping near the freezing mark. Be sure to tend to any sensitive vegetation with frost expected. Plenty of sunshine for the start of the workweek as temps climb to more and becoming more mild. We have a few weak systems moving through around Wednesday and Friday bringing a chance for rain. Hope you enjoy the cool crisp evenings! Have a good one!